The first member of the Galaxy S II U.S. trio paid us a visit and we have a whole bunch of initial impressions to share with you. 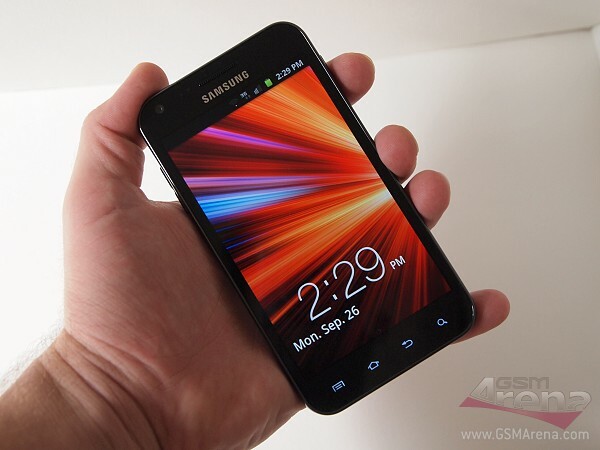 The Samsung Galaxy S II Epic 4G Touch is the CDMA version of the powerful droid, already available exclusively at Sprint Wireless for $199.99 with a two-year contract. It has grown in size, compared to the Galaxy S II which we (and about 10 million other people) have already grown quite fond of, dropping the 4.3″ Super AMOLED Plus for a 4.52″ display of the same kind. WiMax connectivity is also on board, promising some serious network speeds. Sounds enticing, doesn’t it? Let’s see what else this droid has to offer. The Epic 4G Touch is powered by the same 1.2GHz dual-core Exynos CPU as the I9100, which is still the performance benchmark in the dual-core community. A gig of RAM is also on board, along with 16GB of built-in storage, expandable via microSD cards. Like we mentioned above, the screen has grown quite notably compared to the original Galaxy S II and, dare we say, this is not a bad thing. The Epic 4G Touch is also significantly thicker than the I9100. The main reason for this is the larger 1800 mAh battery which it packs. The weight however, has remained at, the highly acceptable for a device of such size, 130 grams. The rest of the hardware specs are no different than the original Galaxy S II. The Samsung Galaxy S II Epic 4G Touch comes with Android 2.3.4 Gingerbread, dressed in the latest TouchWiz UI from Samsung. We have prepared a video of the handset in action for you. You can watch it below. Our first impressions from handling the Epic 4G Touch is that it is fast – very fast to be precise. In order to give you a graphic expression of the speed of the device, we ran a few benchmarks on it. Here are the results. Not too shabby, right? We have more features of the Samsung Galaxy S II Epic 4G Touch in the pipeline, so stay tuned!